Yesterday, I attended the “2016 Federal Forum: The Intersection of Innovation and Action” in Washington D.C. 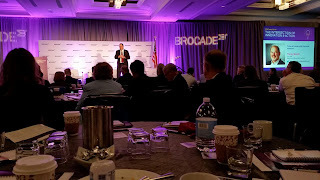 Thanks Brocade Communication Systems for organizing such great event. The messages conveyed are clear and in good timing, especially with the directional keynotes from Tony Scott, U.S. CIO, Executive Office of the President, and Terry Halvorsen, CIO of DOD. Government is looking for proposals for next generation IT. With Silicon Valley tech fever winding down, this is the time that we should adopt the great new technology innovations to enhance the main street economy, in both private and public sectors. We should carry further the innovations to business applications and adoptions. It is not unknown that the IT spending in business programs has grown rapidly. However, such growth is mainly due to the increasing maintenance and operation cost dealing with the silo legacy systems accumulated since 80s and 90s. As Tony mentioned, about 80% Federal IT spending is on operation and maintenance, while other 20% has been used mostly to support policy changes that imposed to systems. There has been little capital spending that supports new system constructions. However, this is supposedly to change now. In order to take advantages from the new generation technology innovations and to evolve into digital new economy, government is looking for ideas to build next generation IT. Action is Now! In order to build the next generation systems, the big picture understanding is essential, due to the inter-connection and inter-relationship in currently Internet-connected environment. The notion and practice of Inter-Enterprise Architecture (as introduced in previous articles) can play an important role in this endeavor. Technology innovations provide us with point solutions and better construction components and materials; we also need next level innovations to put things together with new technology adoptions and utilizations in business domains. We need to build common infrastructures for shared economy, where the business and operation models need to be well-designed. We may need to rethink the currently private ownership of the infrastructures for public utilization, how far this can go, who should be the owners of various common infrastructures in operation (e.g. for different business domains, geographical areas, communities, etc. ), and what the eco-system should look like. The Inter-Enterprise Architecture is in a good position to unit them and to help new model designs.